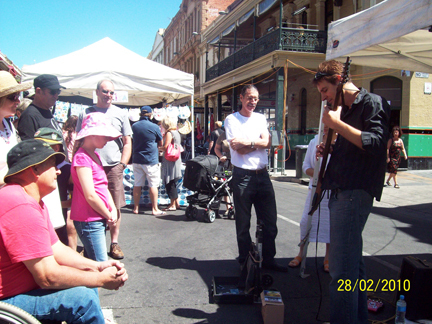 The 10-year veteran Stickist plays his original sounds full-time on the street in Adelaide, Australia. His new CD, Morn's Landing, takes his normally spare solo Stick sound into electronic territory, but he's just as much at home accompanying a full vocal ensemble in a large church sanctuary. Andy will be performing and giving a presentation on The Stick at the National Folk Festival in Canberra April 2-4. Andy Salvanos doesn't follow the rule book when it comes to being a steeet musician. He doesn't use a lot of gadgets like loopers or backing tracks, and he doesn't play a lot of familiar music to attract attention. Rather, Andy draws in his listeners' attention with his straightforward style, and a laid-back demeanor that has become well-known among members of the greater Stick community, and among a growing audience in his adopted home country. Andy has released three CDs of all-original music available from CDBaby. Fragments (2006-07) - a sampling of improvisations, solo pieces, loops and some tracks with backing. Closer (2007-08) - nominated for "best solo instrumental album" by the 2009 Just Plain Folk Awards. Solo performances with a very relaxed feel. Morn's landing (2009-10) - new release with a more "electronic" sound incorporating many styles. Andy plays a refurbished vintage 1985 ironwood 10-string. Three songs by Andy at January's 2010 Australian Stick Night., "Summer", "Running water" and "Juggler's Song"
Greg: How long have you been playing as a "full-time" street musician? Andy: Just over three years now. It was a premeditated move on my part to get back to making a living playing music. I also knew that I wasn't getting the mileage in my fingers as a part-timer, and playing on the street allows you some leeway to build performance skills while you're getting paid for it. I'd been observing street musicians for a few years; some very successful, most of them not. I had a gut feeling that I would be able to at least scrape by. So I cobbled together my album Fragments and started with 10 burned copies. This lasted for about 3 months at which point I was spending more time on CD duplication than playing. The fact that people have responded to my music is just amazing. In many ways it's the most enjoyable gig I've ever had. Greg: Did you ever play another instrument on the street, or only The Stick? If so, how is it different for you with The Stick? Andy: Obviously, playing an "unusual" instrument can be an advantage as a street performer. I think bassist Guy Pratt (Pink Floyd, Madonna) said something like "when someone mentions the Chapman Stick, I think of busking". Anything that attracts a bit of attention tends to be beneficial. 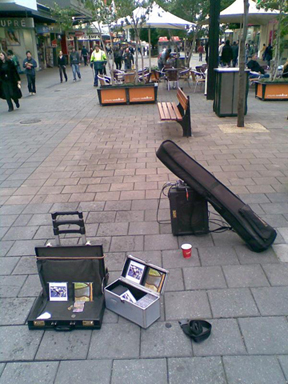 I never did much busking as a bass player, mainly because the people I worked with didn't. My approach to the instrument was also totally different; I wasn't really into playing solo bass. These days I would probably give it a go! Performing solo with the Stick has made me much more proactive about my livelihood, as well as helping me confront my weaknesses as a musician. You can hide a bit more in a band situation. To be honest, I had a very lazy attitude to my music career for many years. Greg: Since most people are still unfamiliar with The Stick, do they assume you're playing an Australian instrument? Andy: It happens regularly. It's pretty funny when people from LA come up and ask me "where can I buy one?". Every now and then, the tables are turned and someone takes me by surprise. For example, I recently ran into some of Jim Meyer's Canadian friends in Adelaide. Greg: Aside from the obvious differences of staging and "audience involvement", what are some internal differences for you between playing in a concert hall, club, festival stage and on the street? Is street performing more of a "job" to go to, or do you think about it in the same way as these other performances? Andy: I think of any performance as a combination of love, work and sheer terror! This might surprise people, but street performing for me is far more internalized. I'm more or less in my own little world until I'm approached by someone. Busking has it's own unique pressures, like when people appear to be ignoring you completely. It can be disheartening, but you get used to the ebb and flow of business on the street. As for solo concert situations, I'm still very much a novice performer. The hardest gigs for me to do are small intimate venues, but they're often the most enjoyable. Greg: As a soloist, do you only perform original music? That seems to be a gutsy choice, especially playing on the street, where people expect more familiar tunes. Andy: The thing that drives my Stick playing is a determination to create my own music. I don't knock people playing covers or adapting classical music and standards to the Stick, but it's not something I'm interested in. This obviously doesn't preclude learning concepts from other players - I've been actively stealing ideas from people like You and Bob Culbertson for the last ten years! As far as street performing goes, I could probably make more money by playing some "classics". I could also dress better, play louder, use loops - all of these things could make me more money. But you also cross the line to becoming a circus act of sorts. It's a tradeoff. As it stands now, I'm doing exactly what I want, and still getting interest from festivals and people who want to record my original material. I've found that people start requesting my songs if they like them. Greg: Tell me about the Graduate Singers concert. How did that come about, and how would you describe your role in the music? Andy: Conductor Tim Marks heard me playing in the mall and approached me with the idea. His concept was loosely based on (saxophonist) Jan Garbarek's collaboration with The Hilliard Ensemble. Tim is an exciting and progressive choir director, and the Graduate Singers make a point of doing a "surprise" concert every year. What we hoped to achieve was a blend of old and new, resulting in something that hadn't been done before. It was a learning process for everyone, because we didn't have a lot of rehearsal time, and I had no idea what to expect in terms of working with so many human voices. Likewise, the Stick surprised the choir. I think they were expecting something more akin to en electric lead guitar, soaring above everything. Instead they found something more subtle with a "vocal" quality, as Tim described it. I felt that my role was to embellish the strong choral pieces and at the same time show off the versatility of the Stick i.e. as a single lead voice, rhythmic bass instrument or full-range accompaniment. In the end, some pieces worked better than others in a performance setting, but I think we all came away with big smiles on our faces (and a hint of relief). Greg: Your new disc Morn's Landing, is very different from previous offerings, more "electronic" and aggressive. You mentioned to me that this was something of a one-off, but having it in hand, are you thinking about performing this material at some point? Andy: I do play a few of the pieces in a solo context, e.g. "The market marauders", but I have no plans to perform the album as a whole. Most of the music was recorded in 2007 for a project that never eventuated. It was an opportunity for me to do something more structured and also to use the Stick as a multipurpose instrument e.g. playing with a pick, different effects etc. I'd only done rough mixes and a bit of unfortunate heavy handed limiting when my hard drive died. One day last winter I decided to hand out a few copies and got really positive feedback, so I added a few tracks and decided to do a small run of 500 CDs. I don't want to sound dismissive of the album, but I'm very much into my new solo material and where that's going at the moment. Greg: So it's just a little over 10 years that you've been playing. Having had that time to digest it a bit, what for you was is the "essential" element of in learning how to play this instrument? Andy: From a creative point of view, I knew what I wanted to hear before I picked it up. I'm not talking about the actual sound, but the music I wanted to play. I've never had that experience with another instrument; not to the same degree anyway. Physically, it was crucial to let go of the hang-ups about the tuning, lack of open strings and technique. I had dabbled with tapping on bass, so that wasn't very much of an issue. The great thing about the Stick was that I could play nice chords and melodic parts almost instantly; as soon as I figured out a few basic chord shapes on the bass side. I don't want to ruin the "mystique" completely, but to Emmett's credit, the Stick is an exceptionally easy instrument to get a nice sound out of.